Simpson Millar’s Travel Claims Lawyers have an enviable reputation for recovering compensation for those holidaymakers who have suffered from an illness whilst on package holidays to Hurghada, Egypt. Claim Compensation for E. coli 0157 food poisoning! Looking for a Holiday Illness Claims Lawyer? Travelled with Thomas Cook, Virgin, Thomson or First Choice? Salmonella – E. coli – Shigella and Cryptosporidium Claims Specialists. Within a stone's throw of the Eastern Arabian Desert and the Giftun Islands this popular tourist resort boasts an average daily temperature of 30 degrees Celsius and is a perfect destination for windsurfers, yachtsmen and scuba divers. Hurghada's stunning crystal and coral filled waters set against amidst a desert provide a spectacular holiday destination, but what if your holiday is spoilt by illness. Food poisoning and illness outbreaks can occur when travelling with any holiday company including Airtours, Thomson, Direct Holiday, Thomas Cook etc. Holiday illnesses can be caused by bacteria, viral or parasitic infections including: Salmonella – Shigella – Giardia Lamblia and E. coli. Foodborne bacteria, viruses and parasites should concern tour operators as they can cause profuse diarrhoea, cramps, fever and dehydration to hotel guests. Illness Fact: Egyptian money stays in circulation indefinitely due the State only producing a small amount of currency. The currency often has an unpleasant smell which should alert you to the fact it is likely to be contaminated. Imagine the local bazaar traders cutting up fish barehanded and using the same hands to handle the currency in temperatures exceeding 30 degrees. Many Egyptians also carry their money in their shoes. If you have suffered sickness, i.e. Salmonella, Cryptosporidium etc. in Hurghada, Egypt, and are seek compensation for a ruined holiday, contact Simpson Millar’s travel team immediately for a free initial claims assessment. Our team of travel specialists handle hundreds of claims each year against tour operators pursuant to the Package Travel Regulations. 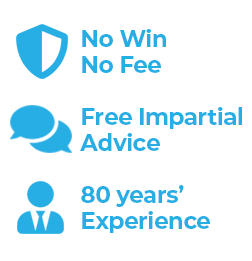 Why not call us today to see if can help you on a No Win No Fee basis. Contact us on 0808 145 1353 or complete the online enquiries form and see if we can take on your holiday claim against Thomas Cook, Thomson Holidays or any other tour operator.